Flipboard has turned on new Books categories in its iPhone and iPad apps, and the content they contain might surprise you. 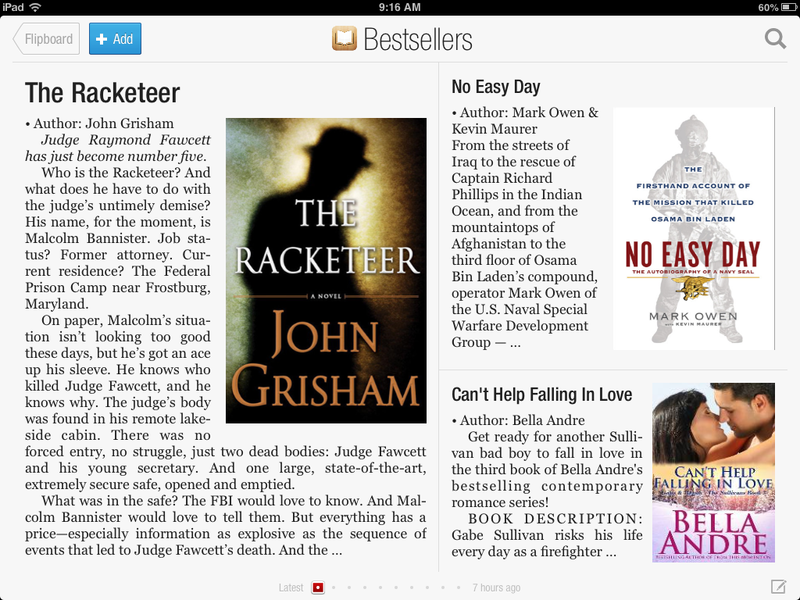 There’s a smattering of featured categories you can add to you Flipboard right now, including Bestsellers, Biographies, Cookbooks, Business and Fiction, and essentially each of these operates as a Flipboard -based window into Apple’s iBookstore. Each carries Apple’s iBookstore icon, and each provides a selection of featured iBookstore titles, with lengthy descriptions, author/publisher information and link to the title in the iBookstore. This is a move that’s pretty clearly designed to give Flipboard access to a new revenue stream, since it’s using Apple’s iBookstore affiliate program with this system. That means that Flipboard gets a 5 percent cut of sales that result from purchases made by the visitors it drives to Apple’s digital book marketplace. And for Apple, it’s a way to increase interest and visibility for its Amazon Kindle bookstore competitor. The deal is active in the U.S., Canada, the U.K., Australia, Brazil, France, Germany, The Netherlands, Italy and Spain, where it should help Apple get its ebook offerings in front of Flipboard’s significant audience (1.5 million active daily users, according to recent stats). The size of Flipboard’s audience is good, but it’s the nature of the readership that makes this a smart deal for Apple. Flipboard’s audience are readers, and they’re actively seeking to discover content. Apple’s iBookstore as it’s currently configured is hardly optimized for discovery; it has some limited means for highlighting content and breaking things into categories, the same way the App Store does, but people don’t think of it as a discovery platform. Flipboard, on the other hand, is all about surfacing interesting or relevant content, which makes it a good venue to try to target buyers before they make their shopping decisions. For now, this is a books-only arrangement (appearing only on iOS Flipboard apps, for obvious reasons), but there’s no reason that it couldn’t later become a more far-reaching partnership if it turns out to be effective. Books are the natural place to start in terms of content fit, but apps and music could be equally beneficial to both parties if this arrangement works out.